General Admission to Art Party X Price will increase by $5 every two weeks. 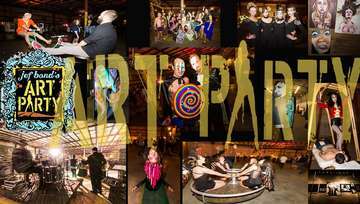 Fast Pass Entry - Skip the Long Lines Premium Seating Gourmet Eats and Treats 3 Premium Drink Tickets 1 ArtPartyX4AHERO 5 juul Pods Price will increase by $5 every two weeks. • Discover the mind-blowing talent of our world-wide Creatives (artists). Art that doesn't necessarily fit into niceties of what sells to the general public. • Not only see but, touch, ride, and interact with art installations that shatter the local artistic status quo. We proudly smash the touristy beach mold with flaming sledgehammers wrapped in Diesel soaked rags. AND THEN, we all hold hands and sing Kumbayah (this is the part where you begin to question what's real and what isn't). • Venue is kept secret until you decipher the clues. It's our homage to the bygone Rave days, and countless nights, of our collective youth. Something cared about you enough put a miraculous thought processing machine between your ears and we want to see you flex it. I am at least 21 years of age for a single ticket purchase or 21 years of age for multiple tickets purchased. I agree that I will be attending with any patrons under 17 and that I am the parent or guardian of 21 years of age and that these patrons are a valid age of 13-17. I agree that I will have to show valid Photo ID with a birth date for entry into the show. I further acknowledge that this show has explicit adult content including; language, sexual content, and material that is not suitable for children under the age of 17 and some adults as well. You may experience or be apart of a performance that may be offensive to some. There are no refunds and all sales are final. Costumes are encouraged, however your face must be available for ID check. Warning this show may be sensitive to heart conditions or abnormal blood pressures, neck, back, or similar physical conditions, expectant mothers or possibly pregnant, motion sickness or dizziness, medical sensitivity to strobe effects, medical sensitivity to fog or haze effects, claustrophobia, recent surgery or other medical conditions that may aggravated by this show, ADA guest must be transferred to assigned seat with assistance from their party; show will not assist, guest with service animals please see show staff for assistance, closed caption please see staff for assistance. Additional ticketing policy: All sales are final. All acts advertised were available at the time of publication, however, acts and performance times are subject to change without notice. No refunds or exchanges. Passes/tickets lost or stolen will not be replaced. Management reserves the right, without the refund of any portion of the pass/ticket price, to refuse admission or to eject any person who fails to comply with the rules of the venue, local, state or federal law, or whose conduct is deemed illegal, disorderly, or offensive to management. Persons entering the venue are subject to search for contraband, unauthorized merchandise, alcohol, controlled substances, weapons, firearms, fireworks, video equipment, or recording devices, costumes with guns are strictly prohibited. Any persons found attempting to enter the venue with the forbidden item(s) will be refused access, or, at venue's discretion, allowed to give up the forbidden item(s). Confiscated items will be returned upon departure. Pass/Ticket user assumes all risks of personal injury incidental to the event, whether occurring prior to, during or subsequent to the event. Ticket holder releases management and owners from all liability in the event of an accident, fall, damage, or theft while on the premises. Management reserves the right to cancel any ticket at any time.